This could change fast food forever. Just saying. 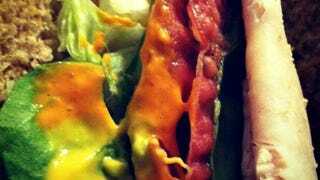 Our friends at Foodbeast report that a Sandwich Artist in the vicinity of Santa Ana, California slathered some creamy Sriracha sauce onto an otherwise normal turkey, bacon, avocado, and spinach sandwich. The color of the new sauce, as you can see in the image above, is drabber than what we're used to squirting out of plastic tubes onto everything we eat. The report indicates that the new sauce is "delightful."